The term Shank's Pony, meaning to go somewhere by walking. Seems to have originated in Scotland around the 18th century. Whatever the origins it was the best form of travel on the day London experienced the heavy snowfall. "Shank's Pony". That is brilliant! I heretofore intend to sneak this phrase into conversation. Many thanks! Gorgeous photo, beautifully framed. My mother called it Shank's Mare. Yep that's a cracking shot. During the silence of an office lunchtime your images take the mind right across the other side of the globe. Cheers. thanks so much for your blog! we were in London a few years ago and loved it. we can't wait to return. your photos are great. Wonderful image, considering what London normally looks like. I, too, like the term "Shank's Pony"...it fits beautifully what I've been doing in Mazatlan; one walks everywhere here!! This is amazing. I have always wanted to visit London, and now I can! Nice picture. I still can`t see how a city can shut down, because of four inches of snow. Did people think it was some sort of toxic material? Perhaps if the Germans had dropped snow instead of bombs during the Blitz, you guys might be speaking German. Your blog's really nice, specially for people like me that are planning on going to London! Great! another great shot but Brrrrrr! Here's a link for the origins of "Shank's pony"
I plan to use this phrase as well! I walk tremendously alot around NYC, especially on those heavy snow days! Once again, you have captivated my attention! how would "shank's pony" be used in a sentence? I suppose the snow was quite the experience when one hasn't seen it in many,many, years.We here in Canada see our fair share if it.Glad to say springs on its way. Grand photo by the way.I can't imagine biking in that kind of weather.Ha! I wanna I've been to London, once but went during the summer :(, the winter looks so much better. I've just been pointed towards your blog and have really enjoyed checking out the photos - some great shots there! May I add you to my blogroll? Just to help StephanieAnn out, if someone asked how you were getting somewhere, your response could be 'Taking Shank's pony'. very nice, will be there next year!! It's amazing, my dream is to live in London! And your pictures is amazing and your blog isn't different! Go to my blog, after, please! Interesting fact. Wish I could experience that snow, or any snow for that matter. Great photo, really! Did not know the phrase "Shank's Pony". Thanks for the information. Ciao. A. You have added another fan to your fanlist. That's me. I'm always dazzled by your fotos. They're all so amazing. Like Stephie said though, I too wish I could experience snow. First thing I'd do is eat it. Just kidding. Wow!!! I just discovered your blog, and I must say is lovely!! Oh and I thought I was cold! What a beautiful shot! And thanks for the low down on "shanks pony"! Wow - LOVE your blog!! I have always wanted to visit London and your pics are excellent. Keep it up! ooh,I have been dreaming of visiting london for many years.So interesting.When it's snowing in our country,people don't mind about it.it's very usual situation. Wow. Look at the bike rack. You know that everyone is planning to stay inside. I had a laugh seeing how a bit of snow can paralyze the Brits. All my friends up there posted photos of empty London and snowmen lots and lots of snowmen on their social profiles. There you go I alwaya thoguth it was Irish and it is still a very familiar saying.Gorgeous scene. Well, my family referred to it as "shank's mare" but it is the same end result. Love your photos! These pictures are amazing and well taken, the snow is gorgeous in this picture. 6 degrees Celcius - brr - have to say, snow in inthe country is more romantic than snow in the city - it quickly turns to slush and mud (I'm from Holland). Great pics of London by the way-cheers. hello! thisi is my first time visiting it place. Love this photo. 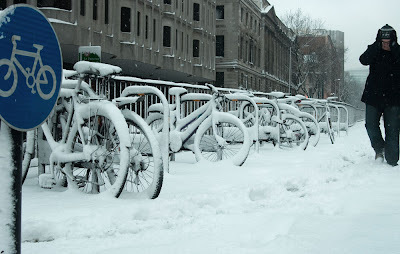 Amazing the amount of snow on those bikes.